An important detail to remember when writing for Grace: She really is kinda crazy. Speaking of my Twitter self, I commented while making this comic that searching for references for people with their arms crossed made me feel like the entire search results page was judging me. There are a few image searches with similar uncomfortable results, such as people hiding, glaring, laughing, etc. Maybe it doesn't mess with most people's heads, but it messes with mine. It's possible I'm putting too much stock into what people in stock photography think of me. 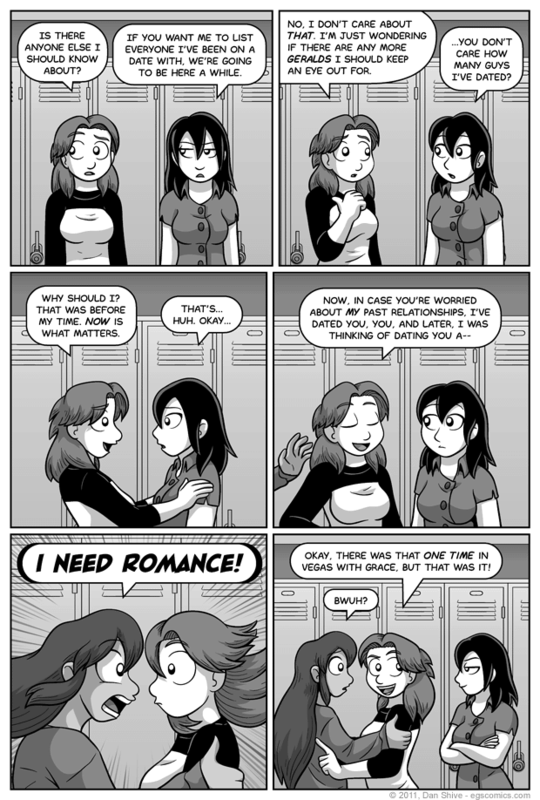 EGS will never have gratuitous locker room scenes! Not out of good taste, mind you. Lockers just make for complicated backgrounds. This applied to the last two comics, in particular the previous comic, but it was actually pretty easy going for this comic. Shown from any new angle, yes, adding the details of every last locker door does get complicated. When it's an angle that's already been done, however, the fact that I work in vectors mean I usually don't have to make anything new. I just have to resize, position and put a mask* over each panel's background as necessary. In short, that's pretty much all I had to do for this comic's backgrounds given that I had already made the lockers from this angle for the last two comics. I usually don't have that luxury, but when I can legitimately do that (i.e. it fits the scene and isn't just laziness), I am soooo happy. This helped me during the Q&A as well. So long as being viewed from the same basic angle, the background behind Amanda and her band of hooligans rarely changed. I still had to redraw the chairs and such a bazillion times, but whatever. It helped give me more time to write the script for this storyline. * Masks are shapes put over images and such that limit how much of them are visible. The lockers extend beyond the panels they're in, but thanks to masks that match the shape of the panels, they're not visible beyond where they're supposed to be.